Say what you want about Trump’s tweets, new media has given us a new way to see into the psychotic hearts of our politicians. 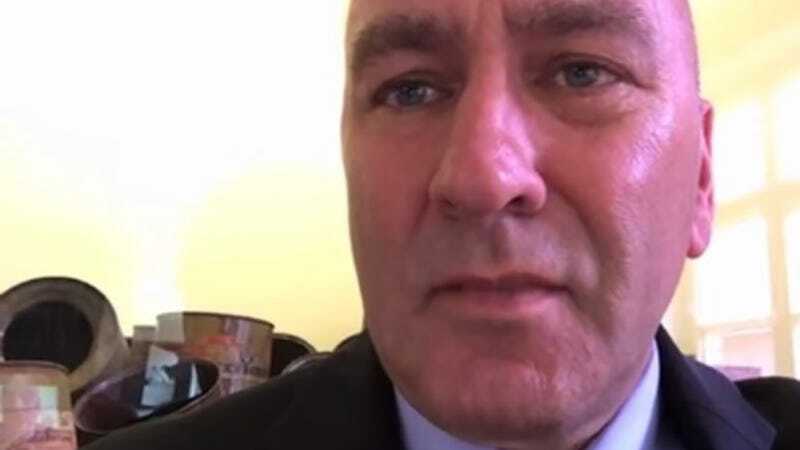 The latest representative to fall into the trap of oversharing is Clay Higgins of Lousiana. Over the weekend Higgins used his visit to Auschwitz as an opportunity to broadcast some Islamophobia. But now he’s sorry. The world’s a smaller place now than it was in World War II. The United States is more accessible to terror like this, horror like this. It’s hard to walk away from gas chambers and ovens without a very sober feeling of commitment—unwavering commitment—to make damn sure that the United States of America is protected from the evils of the world. The video ends with a janky Photoshop of Higgins with his cowboy hat-wearing head bowed, wearing a badge, and the Isreali and American flags superimposed over him. The message is clear: Higgins is the man that can save these countries. Vote Higgins. I filmed the Auschwitz message with great humility. My intent was to offer a reverent homage to those who were murdered in Auschwitz and to remind the world that evil exists, that free nations must remember, and stand strong. However, my message has caused pain to some whom I love and respect. For that, my own heart feels sorrow. Out of respect to any who may feel that my video posting was wrong or caused pain, I have retracted my video. But that’s not how the internet works. The fundamentalist Christian website that the video was uploaded to has removed the post, it’s not on his Facebook page anymore, but just one copycat upload on YouTube is currently ranked #32 on its trending list. Higgins didn’t need to be a cop anymore, he was a YouTube celebrity with an eye on politics. Jimmy Fallon said he should run for president. As a cop, he could appeal to anti-black sentiments, but as a politician, it’s all about anti-Muslim rhetoric. While he didn’t get into much of that outside of a pointed reference to “terror” in his Auschwitz video, his audience knows what he means. Nice. He makes sure to frame the War on Terror as a clash between Christianity and Islam, then proceeds to call for the execution of anyone suspected of being a radicalized Muslim. Is he saying that we should deny terrorists entry into the US? Of course not, how would that work? It’s not like their passport says, “terrorist.” You get his drift. Kill them all. And the cycle continues. Higgins apologizes and takes down his video. But it lives on and his supporters got the message. It’ll be one more example of the mainstream media and Jews censoring someone just trying to speak the truth. “Kill them all,” they’ll say.